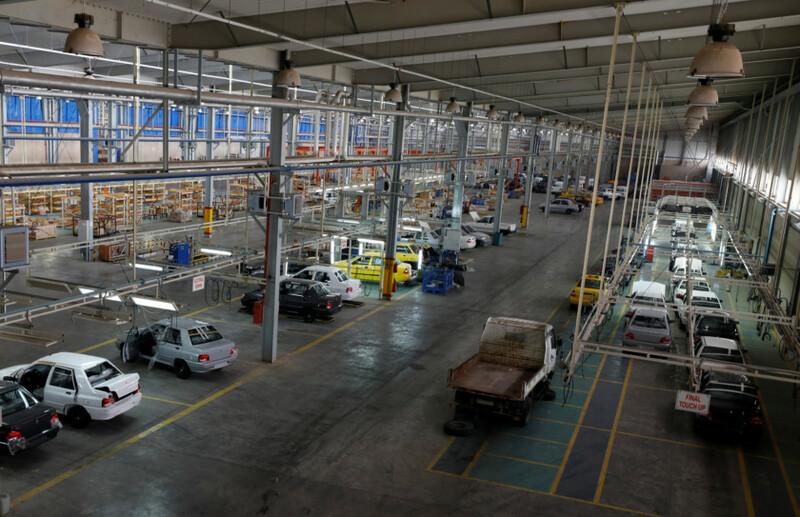 Damascus: At an Iranian government-owned car plant near Homs, the small number of vehicles on the assembly line underscores the obstacles hobbling Tehran’s economic ambitions in Syria. The plant was set up before Syria’s war began as the two allies tried to bring their economies closer together and was restarted in 2016 on Tehran’s orders after having closed early in the conflict. Instead of the 50-60 cars a day it assembled before the war, it now makes only three or four, and dozens of vehicles gather dust in its warehouse because even when discounts are offered, too few Syrians can afford them. Car parts have to be shipped by sea instead of via the shorter land route because Syria’s border with Iraq is closed, and Western sanctions make it hard to transfer money. That combination of a battered market, logistical problems and sanctions -- as well as competition with companies from Damascus’ other main ally, Russia -- affect many Iranian businesses operating in Syria. Tehran has played a crucial part in helping President Bashar Al Assad overcome seven years of rebellion, providing military expertise, materiel and fighters from militia it supports around the region. It has given Damascus direct financial aid and help restoring its infrastructure, but has also angled for economic concessions and market access that might eventually provide some compensation for its investment in the war. Iranian businesses say they want to export to Syria or do business there, and are optimistic that the market will improve as Damascus pushes towards reconstruction. “We’re looking at construction projects there -- residential, office space, sports halls. There’s a very good market there,” said Mahdi Gavam, public relations head at Sherakate Omran va Maskan Iran, a developer tied to the state-controlled Bonyad Mostazafan, a charitable foundation that took over numerous private businesses after the revolution. Since the conflict began, there have been more Iranian goods for sale, though not on the same scale as in Iraq, which shares a long border with the Islamic Republic and where Iran has gained extensive market dominance. Iranian dates, saffron, raisins and cosmetic products are found in Damascus shops, alongside goods from numerous other countries. 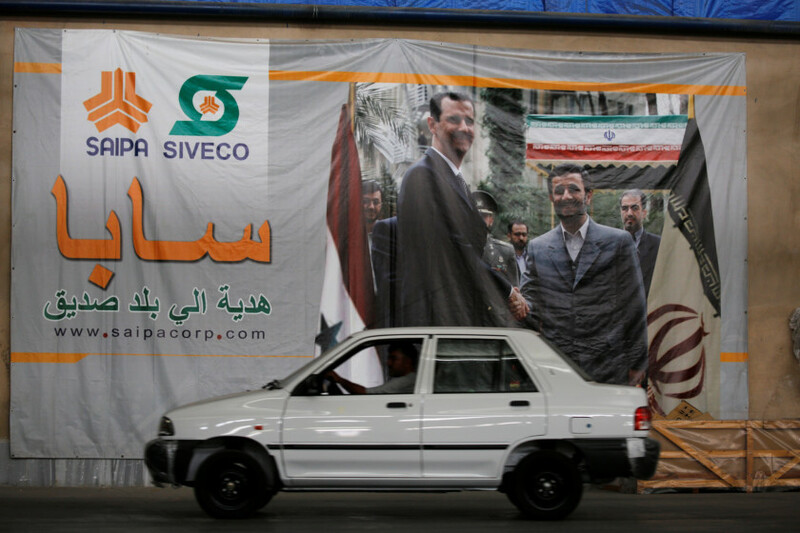 In the Saipa Syria car factory, a large poster celebrating the alliance shows Assad during a visit to Iran alongside its then president, Mahmoud Ahmadinejad. With over half the country back under his control, including the biggest cities, and with the reopening of the border with Jordan accelerating Syria’s reintegration with neighbouring economies, Assad is turning towards reconstruction. But while front lines seem to have stabilised for now, the war is not over, big parts of Syria remain outside Assad’s grip and the economy is a fraction of its pre-war size. “There’s a lot of damage of course. A lot of the economic infrastructure has been destroyed. But it’s also an opportunity,” said Reza Aghaziarati, export manager and adviser for Feridolin home appliances manufacturer. Syrian law protecting domestic industry bars imports of electrical appliances, but Feridolin wants to set up a factory in Syria to make them there, Aghaziarati said. For Saipa Syria, the most pressing difficulty is limited demand, said its general manager, Emad Alavian. “The purchasing power of customers dropped, but we see an improvement in conditions. We see new movement,” he said, adding that he hoped to double production in 2019 to around 2,000 cars from the 1,000 he expects to assemble this year. Saipa makes small, modestly priced cars and it is poorer Syrians who have been hit hardest by the war. “We took big discounts from Iran to help the Syrian customer,” Alavian said, but demand has stayed low. The car parts are shipped in wooden crates to the Mediterranean port of Latakia, a journey that adds thousands of miles to the direct -- but closed -- land route through Iraq. “There is no problem with transporting the parts from Iran, but there is a problem with converting the prices of parts, because there are problems with bank transfers,” Alavian said. Western sanctions have made transferring money overseas or bringing it into the country a headache for all Syrian businesses. Cut off from many of its former trading partners and from most foreign investment, Damascus has enthusiastically encouraged business ties with Iran, helping set up a joint chamber of commerce. The Syrian and Iranian governments have agreed to set up a joint bank to facilitate money transfers without triggering Western sanctions, although it is not clear when it will start or how effective it might be. Several major projects and economic concessions it has announced have made little or no apparent progress months later, including a mobile network licence, phosphate mine and oil refinery announced in January 2017. Meanwhile, Russian companies have already started operations in both the phosphates and energy sectors, leading to speculation in Iranian media that Russia is edging it out. Iranian construction firm Melli Sakhteman, which is also linked to Bonyad Mostazafan, sees Russian companies as its biggest competitors, its engineering and construction deputy Majid Rostami said by phone. “Since Russia has the military upper hand in Syria, then Russian companies who have better technology and greater financial strength should be able to operate better in Syria,” said Saeed Leylaz, an economist and political analyst in Tehran.